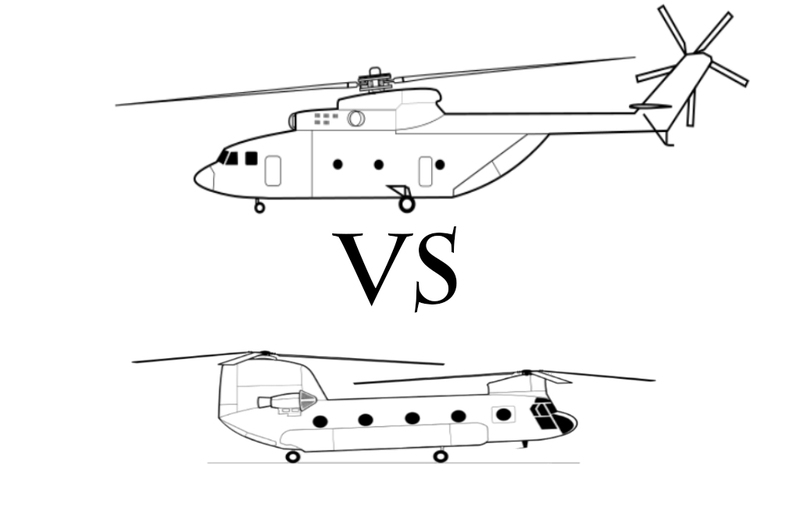 Mi-26 and CH-47 are a couple of iconic helicopters designed by former rivals during the Cold War, although designed for heavy lifting , these two helicopters were designed for two entirely different roles and have been wrongly compared. One was designed to transport mechanized divisions and tactical ballistic weapons whereas other was actually designed to be a work horse for the US army, essentially an air truck which could transport wide variety of stuff for its operator. Both the helicopters are still in production, nearly 3-4 decades after their first flight and have been exported to many countries. These designs just don’t get old. Lets have a fair comparison of both in this article and settle the differences once and forever. Soviet Union had a massive territory, most of it inaccessible during its harsh winter. Soviet forces trained hard to operate in these areas especially in winter as twice in history, the severe Russian cold had given them an advantage over their enemy and repulsed the attack by a credible enemy. They faced the problem of transporting vast amounts of ammo, fuel, weapons, troops, even strategic and tactical weapons to these outposts. Once established, these outposts could be a big and deadly surprise for an invading enemy. By the late 1960s, the Mi-6 was not being able to answer the needs of the ever growing Soviet forces, a new helicopter was needed. 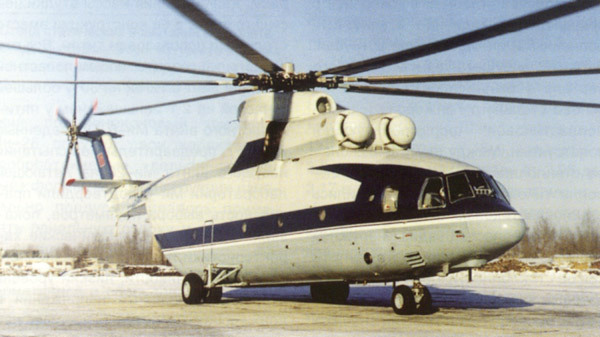 Mil helicopter bureau started development of the Mil V-12, the largest helicopter ever designed and built, but it ended up being an over kill due to its complex design. It was supposed to carry a staggering 40 tonnes, over 100s of kilometers, the Soviets were quick to realise that this wasn’t what they needed and scaled back on their requirements. Something a bit smaller was desired, a payload of around 20 tonnes, enough to transport light armored vehicles, or a squad of troops. This requirement was put up and Mil answered it with what entered service as the Mi-26. It was supposed to have a large internal volume, so that it could carry warheads, missiles, engines, fuel tanks for tactical or strategic ballistic missiles or cruise missiles over a range of atleast 800km. Here is the flying behemoth of a helicopter, the Mil V-12. Gives the scale of the V-12, that smaller helicopter is an Mi-2, its height is 3.75m. The design bureau went through several designs, including tandem rotor design. Since the payload was very high, the gear assembly, drive shafts and other components would have been massive and much more complex compared to a conventional single rotor design. They also took into consideration the aspect of maintenance, as the Soviets had a tendency of designing stuff based on pure utility and ease of maintenance, it was decided to go for the single rotor design. 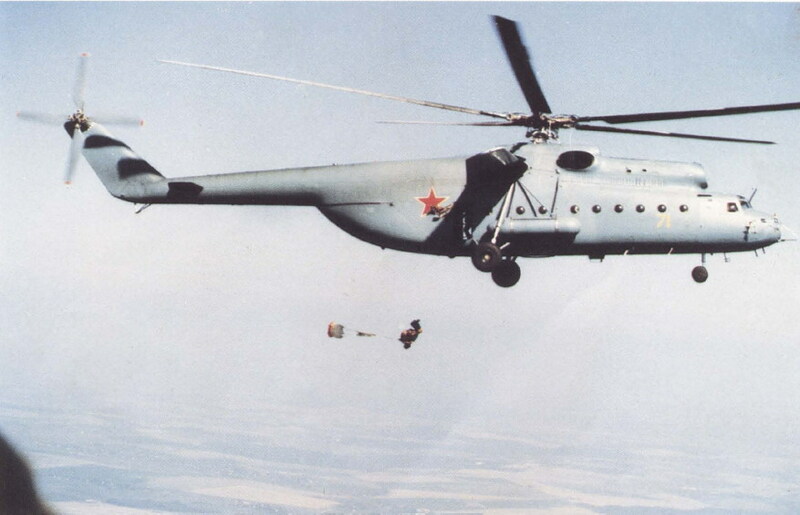 Mi-26 entered service in the early 1980s with several different variants designed for a variety of roles. Piasecki helicopters had successfully produced and sold the H-21 a.k.a. the flying banana to several countries, the helicopter had also proven itself in combat. After being procured by Boeing in late 1950s they got a request from the US army for a new helicopter which could replace its fleet of Sikorsky H-37s. The H-37 was powered by the R-2800 double wasp engine, which also powered legendary world war 2 era fighters like the P-47 Thunderbolt, F4U Corsair and F6F Hellcat. Piston engines suffered from low power to weight ratio and hence a new generation of helicopters, starting with the UH-1 were powered by turbo shaft engines, essentially jet engines giving output in the form of rotary motion from its turbine instead of exhaust at its end. They offered superb power to weight ratio, and allowed smaller but way more powerful powerplants to be fitted on a new generation of helicopters. US army, had specified that they wanted what can be called as a sky truck, which could carry all the things trucks carried in the cargo compartment, to be swiftly moved from one place to another. Designers at Boeing conducted a thorough study of what did the US army exactly want, by conducting interviews with several commanding officers. The requirements they zeroed in are as follows. Wide variety of cargo to be carried, ie a design which could handle a wide range of Center of Gravities (CG) due to the different cargo configurations. Engines placed high up to avoid FOD. Easy maintenance, even with cargo loaded. Ability to operate from the surface of water. 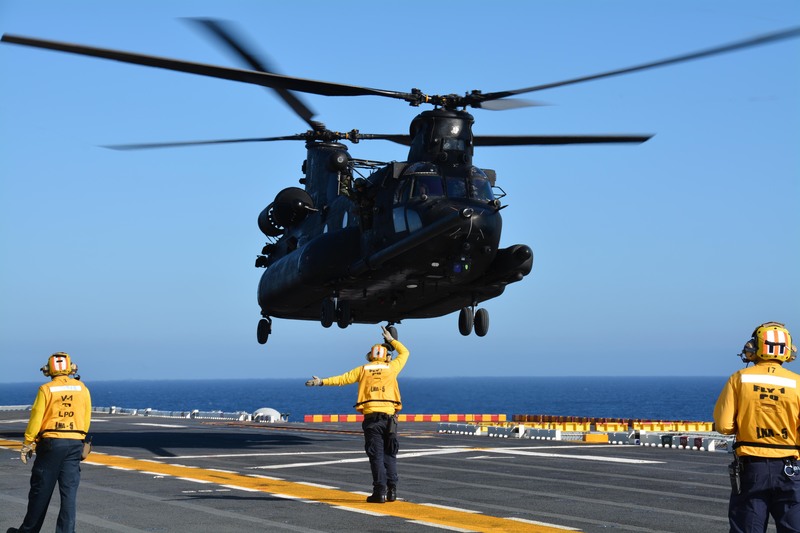 After deliberations on nearly 300 designs, they chose the tandem rotor design which was the best suited for the US army tender due to the following reasons. The design could have much smaller size compared to contemporary designs. Allowed wide range of CGs for a safe flight. More efficient use of power, as no power is wasted by the tail rotor. Was good for amphibious operations. Thus they went ahead with this revolutionary design, in an era when single rotor helicopters dominated the market. 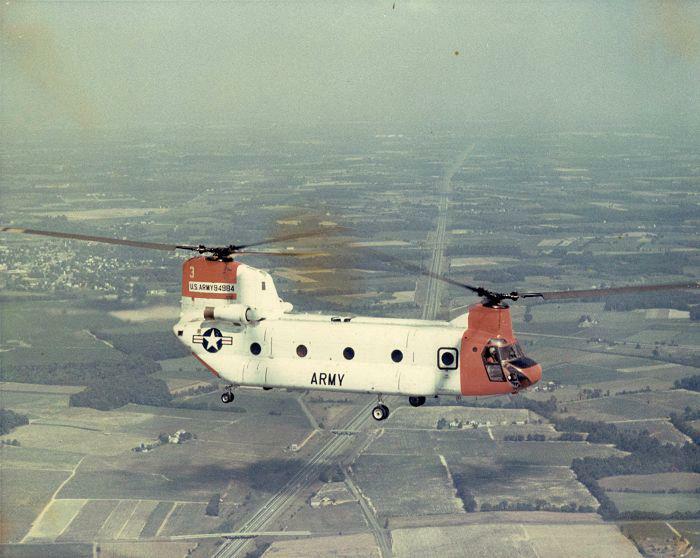 3rd YCH-1B prototype, before it was given the service designation of CH-47. 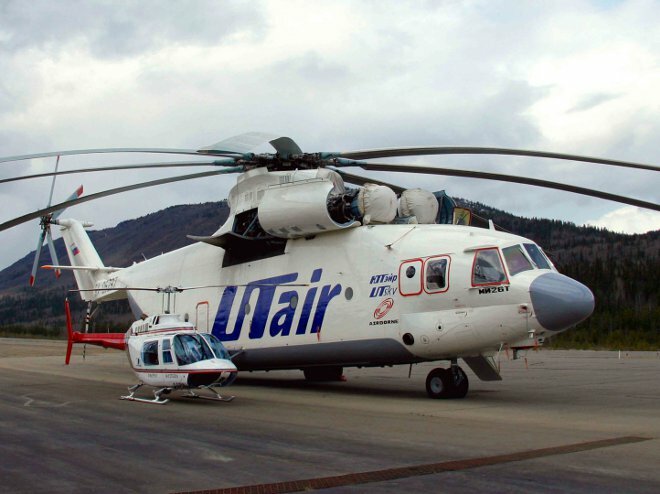 Mi-26 is powered by 2 massive D-136 turboshaft engines, capable of producing over 11,000shp each. These turbines spin a 8 bladed main rotor of 32m in diameter. The size of its cargo hold is around 15×3.2×3.15 in meters, and can lift more than 20 tonnes of payload either inside the cargo bay or slung underneath. 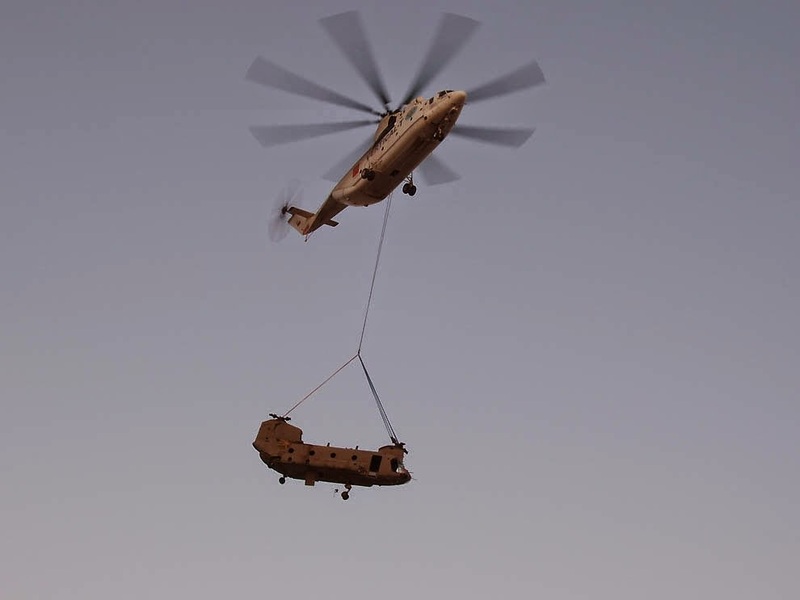 An Mi-26 can literally lift 2 CH-47s if needed, although the Chinooks would need modifications interms of removal of engine, rotors, gear boxes etc. It can carry around 100 civilians or 80 combat equipped troops. Armored vehicles like the BMD-4 and BTR-80 can be airlifted by these helicopters. Imagine a formation of several Mi-26s dropping an entire formation of mechanized units ready for combat, and opening a forward thrust at a place least expected by the enemy. This is a field commander’s night mare. With a maximum range of over 1800km, its very well equipped for doing the job it was designed to do. 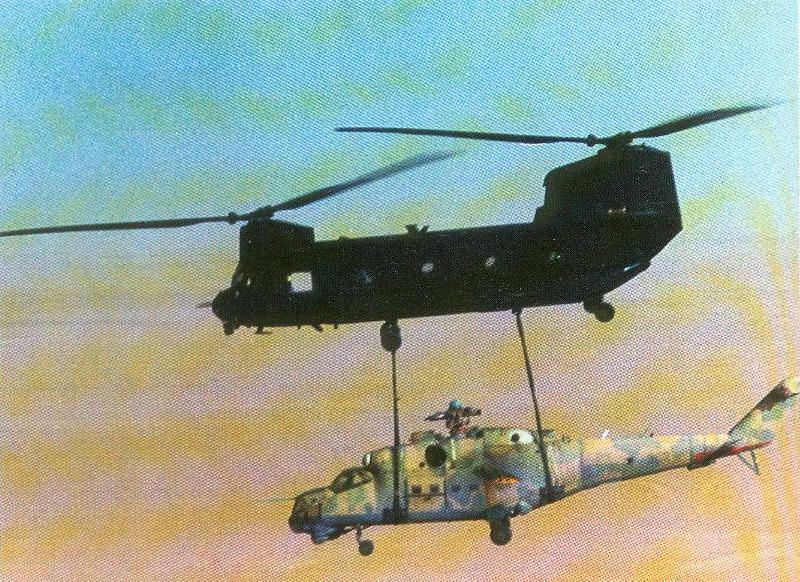 Favorite pic for Mi-26 lovers, here is the Halo lifting a downed Chinook. This helicopter, even though massive and capable, after the end of cold war has little use, it is more attractive to heavy lift companies around the world than the armed forces it was initially designed to serve. 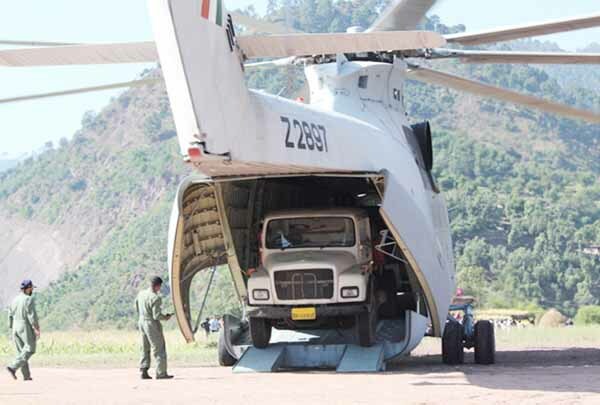 It is actually an equivalent of large fixed strategic airlifters like the C-5 in the world of helicopters and is an overkill for tactical operations which are commonly undertaken by helicopter units in armed forces. A Soviet design for a Soviet need, isnt very well suited for others around the world. The number of international orders for the helicopter are limited, as the production was restarted to replace some older helicopters in Russian service, and upgrade those in storage. 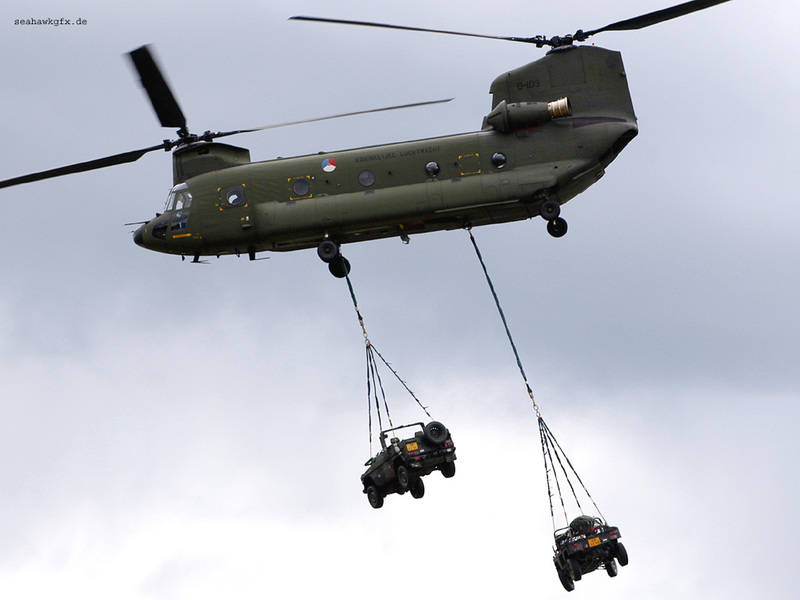 The Chinook was designed to be a flying truck, whereas the Mi-26 was used for flying trucks. 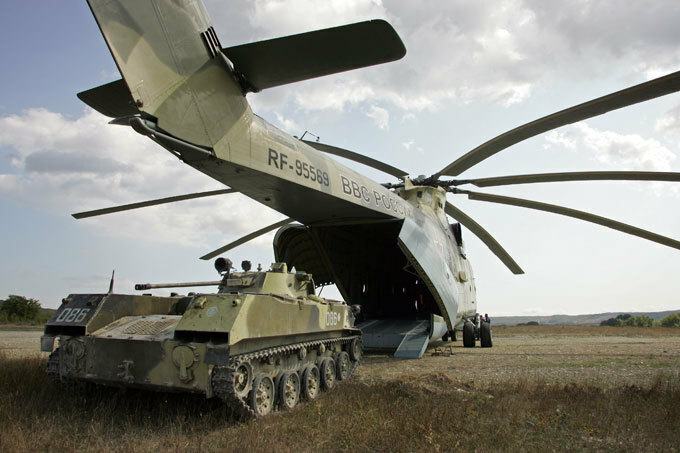 Here is a Mi-26 loading a BMD-3, this vehicle is widely used by Russian airborne forces. Its twin rotors placed at the ends of fuselage, are the best and cost effective way of using up all the power generated by the engines, instead of wasting around 15-30 percent of it on the tail rotor. Powered by two Lycoming T55 turbo shaft engines, it can carry around 11 tonnes in the cargo bay or on the hook. It also has a unique capability, of carrying upto 3 loads, onto 3 different hooks under the fuselage. Thanks to the twin rotor design, it can handle the change in center of gravity due to a load which isn’t slung under its own center of gravity. The cabin is big enough for 44 combat ready troops. 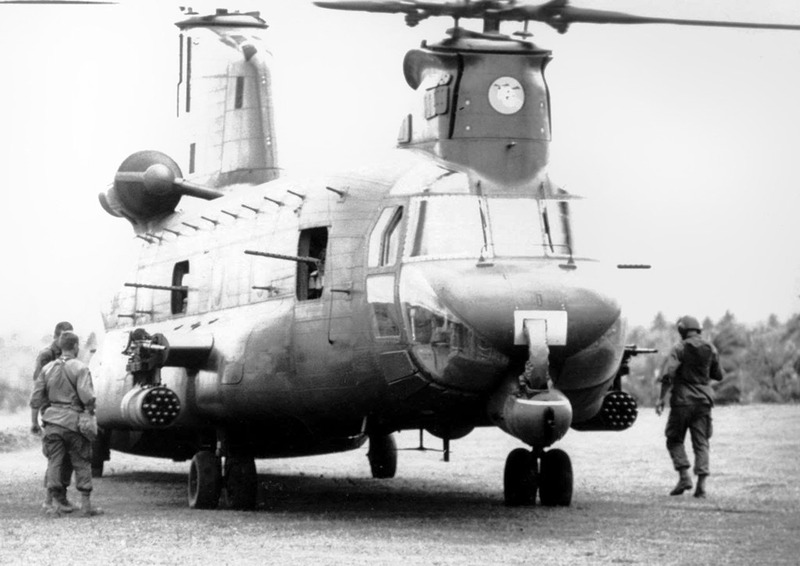 It has also been used as a fire support gun ship during Vietnam war, designated as ACH-47, armed with upto 5 M60s or M2s along with rocket pods fitted on stub wings. This is the ACH-47, showcasing its impressive array of weapons. This helicopter is proof that good designs never die, it has been in continuous production for over 50 years, right from 1962, to this date with several countries ordering Chinooks to replace existing ones or to add new tactical lift capability. This helicopter is also used for spec ops by the US armed forces, the variant MH-47 is specifically designed for it, while the latest variant ie CH-47F is being produced for usual tactical role. For those who are interested to know about the Mil V-12 programme, here is a short video on the massive helicopter. A tabled comparison would’ve added to the bang! BTW great article!